With the appearence of new regulations, entrepreneurs have often difficulties in selecting information. They collide with numerous legal arsenal and end up facing an « artistic uncertainty ». The goal of these sessions is to bring knowledge and skills in order to acquire an overall portrait of the industry. Maximum of 12 participants per session. Reminder of the key legal texts illustrated by practicle examples with the support of work documents handed out to the participant (administrative forms, models of contrats, decree…) and pratical cases. The classes are buit on an interactive mode (Q&A, debate). Author of the book « La circulation des Spectacles – Guide pratique de la diffusion internationale du spectacle vivant et de la mobilité des artistes » (2nd edition : oct 2014). Public concerned Booking Agent, artists, bookers, etc. Social duty of the employer : licences, immatriculation aux caisses sociales, conventions collective agreement, register to be kept, payment mechanism : DUE, pay-slip, AEM, congés spectacle, etc., work contract, functionning of Guso, end of the year administration (DADSU). 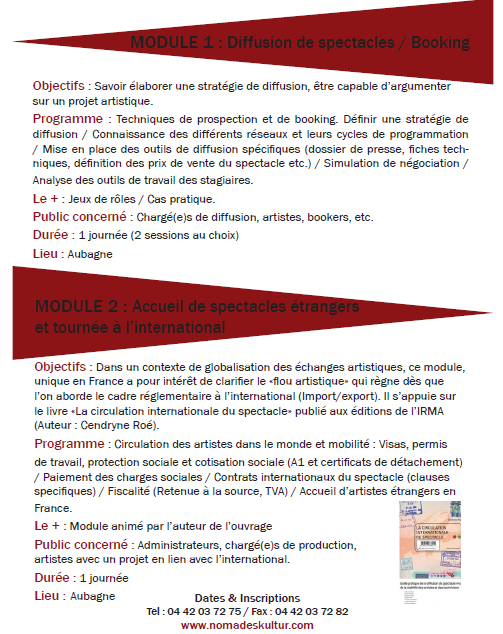 Objectives : In the idea of a globalization of artistic exchanges, exclusive in France the aim of this module is to clarify the «artistic blur » around the international regulatory framework (Import/export). It refers to the book «La circulation internationale du spectacle» published by IRMA (Author : Cendryne Roé). Programm : Worldwide artist circulation des artistes dans le monde and mobility : Visas, work permit, social protection and social contribution (A1 and certificate of temporary employment abroad) / Social duties payment / International live performing contracts (specific articles) / Taxation (Withholding tax, TVA) / Take in charge foreing artists in France. Public concerned : Administrators, production assistant, artist with an international project. le rôle du chargé(e) de production. The role of production assistant.